Is this childhood in Singapore? Share your views! If tuition is enjoyable, can’t it become an event to look forward to? Knowledge acquisition can be an exciting and engaging process! Very true…Hence I don’t believe in conducting tuition drills (yawn). Seems like most tuitions are boring drills? Why is it that most seem to just be learning to get the grade? Instead of really plugged into the larger purpose of learning and also having fun and joy in the process. Fortunately, most of my students (seem to) enjoy my classes. And I frequently remind them that the greater value is the honing of their thinking skills and not the economics. I agree. and it’s about strengthening a multi displinary outlook of the world. Tuition provides the space and expertise for a deeper engagement of affairs that arguably a teacher in class cannot afford, due to time constraints. Yes this is largely what childhood for a growing majority looks like. Even though one may argue that tuition can be enjoyable depending on a student’s outlook on learning, you still have to agree that the primary focus of students and their parents now is on academics and attaining good grades. Nowhere on that conveyor belt does it mention anything a child is interested in, like playing with friends or doing something they are passionate about. 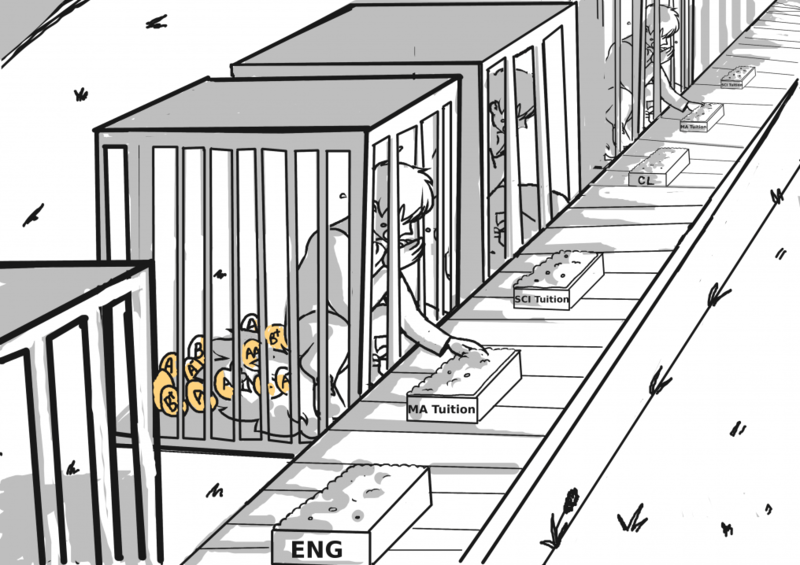 The over focus on academic grades for students and the spoon-feeding of information may be limiting a child’s ability to truly explore their passions (hence the cage). Maybe the focus should be turned to finding a child’s passion and using that as a motivating factor for working hard in school. Thank you for your valuable comments. I assume you are a student. What are you passionate about?